WHERE DO YOU SOURCE YOUR CHAGA? Make sure you know where the chaga you are buying comes from. Not all chaga mushrooms are created equal, and not all chaga sold online via wholesalers is top quality. Chaga grows on birch trees in cooler climates, including Russia, Eastern and Northern Europe, the northern United States, and Canada. But Siberian Chaga has the highest concentration of active ingredients of all available chaga mushrooms. Perhaps this can be attributed to Siberia’s unique ecoregion, with its extreme swings in temperature. Because we at Sayan Health are committed to producing only the finest-quality chaga products, we source only Siberian Chaga. We only harvest wild Siberian chaga mushroom in the forests in the north of Irkutsk region and Khakassia and sometimes in Altai Mountains region at a distance of more than 200km from the nearest town. This ensures ecological cleanness of our chaga and its medicinal properties. We employ people who have many years of experience in harvesting chaga mushroom. Thus we avoid any possibility of getting false chaga mushroom. After receiving raw chaga our factory workers also examine each piece which is another step in our high level quality control. HOW MUCH EXPERIENCE DO YOU HAVE PRODUCING CHAGA? Our manufacturer has 25 years of experience manufacturing chaga. WHAT IS YOUR PREPARATION AND EXTRACTION PROCESS? The founder of our company is a medical doctor committed to producing the finest-quality chaga products and preserving the active ingredients in chaga mushroom that are beneficial to health. 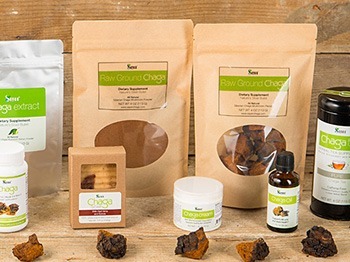 Raw chaga – Since 2007, we’ve used our proprietary technique of drying wild-harvested chaga to eliminate the bitter taste. 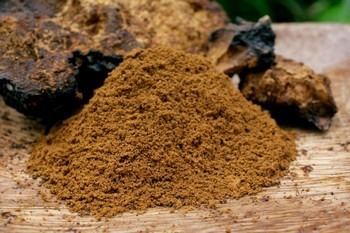 Chaga extract– Producing the purest and most potent chaga extract is a process that requires a deliberate, scientific approach. We are actively and constantly researching the benefits of chaga using various methods. An independent lab, Brunswick Laboratories, determined that our chaga extract has an ORAC value of 153,200 micromoles of Trolox Equivalents per 100 grams (molTE per 100 g). Compare this to acai extract at 102,700 molTE per 100 g, blueberries at 9,621, and pomegranates at 4,479. Our chaga extract is highly potent. The extraction rate is 16%, which means that for every 1 kg of raw chaga, we produce 160 grams of extract. In other words, we process 6.25 lbs of raw chaga to produce 1 lb of chaga extract. The majority of chaga manufacturers use a Thermal Infrared Drying extraction process that does not preserve all the beneficial ingredients. But we use a proprietary technique to prepare raw chaga for a low-pressure hot water extraction method with subsequent freeze-drying process, to ensure we preserve the most essential, beneficial nutrients. Here is a more in-depth explanation of the benefits of our chaga extraction process. WHAT FORMS OF CHAGA MUSHROOM DO YOU OFFER AT WHOLESALE PRICING? We offer wholesale chaga in many forms: Raw– We offer several raw products: Chaga Raw Powder: with mill from 300 microns and up Chaga Chunks: made custom to your request from 1 inch (2.5 cm) to 12 inches (30 cm) Different levels of humidity can be ordered: 10%: very dry, ready to use product; and 15%: if you need to manufacture your own product. Extract– We offer only high-quality Chaga Extract. The extraction rate is 16%, which means for every 1 kg of raw chaga, we produce 160 grams of extract. In other words, we process 6.25 lbs of raw chaga to produce 1 lb of chaga extract powder. We only use a low-pressure hot water extraction method with subsequent freeze-drying process, to ensure our product is optimized with the most essential nutrients.Tea– We offer Raw Chaga Tea, in its original pure form or with a blend of dry herbs. We also offer custom-made Chaga Tea with extracts of different herbs. Capsules– These can be manufactured per your request with either gelatin or vegetarian capsules. Soap–We offer three different varieties of soap. Where do you ship and what is the shipping cost? We ship worldwide. Shipping cost depends on the quantity ordered. We use UPS, USPS or Air Shipping services depending on the country of destination. If you would like to order chaga wholesale or have questions, call or e-mail us. People everywhere, everyday make decisions about their healthcare. Would you trust just anyone with your health? Most likely not. Surprisingly though, some people place more emphasis on who fixes their car, rather than who supplies and what they are charged. their supplementary health products. Those providing your complementary and dietary health supplements should be cause for a great deal of thought. Let’s look at pricing. You may have seen that the price of chaga can and will vary greatly. Should we automatically go for the cheapest? Naturally, we all try to save money on daily items, but cheapest may not be the best way to go. Of course we are all conscious of the cost of living. It is a privilege to have the ability to choose dietary products that may better our health. However, that doesn’t mean we should be naïve or be duped by unscrupulous suppliers who presents them. Is price simply based on supply and demand? Arguably, this is the most over-used excuse to overcharge people in the history of business. Dishonest traders will often use the term to justify overpriced, under-quality goods. Sayan Health, a provider of quality chaga, sourced and harvested correctly, offers chaga at reasonable prices. At around 50 dollars per pound buyers can be assured of the quality supplied. 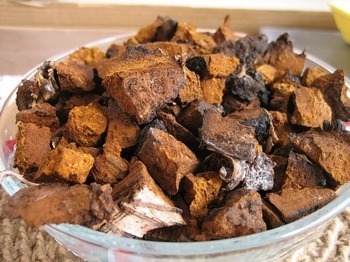 There’s more to chaga than simply finding it on some random website. Research for yourself. Avoid the clearly under-priced products. You seriously may not now what you’re getting. To be honest, suppliers can charge whatever they like, but it is the consumer who sets the standard for price and quality. You have that power. Don’t give it away. Choose wisely. Not all chaga suppliers are created equal. The knowledge, advice and passion about their products will say it all. Look for a history. What are they all about? Do they discuss openly their background and who they are? You go to your favorite fruiter and vegetable retailer because they offer quality and value for money, right? Same rules apply for your health suppliers. Just because its packaged, doesn’t mean it of a quality you should be buying. Look for GMP certified and FDA certified. This is your health. Alarmingly, the products out there being sold can range from poorly harvested, to incorrectly processed chaga. Chaga taken from the ground, or not high enough on the birch tree, will result in a lower quality end result. Believe it or not, some suppliers even pass off chaga from trees that are not from the best and natural environment. It’s not enough that we have now opened our eyes to the benefits of this Diamond of the forest. We, as consumers need to be vigilant and armed when it comes to purchasing chaga. Brewed normally as a daily chaga tea tonic, or added to new recipes for something different, chaga have been given to us by those perhaps wiser and more in tune with health solutions. Today we can use the learnings of the past, but with it must bring modern day awareness, so as not to be swayed by poor quality. From its anti-inflammatory, and antibacterial benefits, through to chaga’s unwavering assistance with providing the highest levels of antioxidants found today, this amazing compound can remain a health support for all who embrace it. Why Are Some Chaga Mushroom Price Per Pound So Cheap? Do you really consider the chaga mushroom price you are paying? Value for money is something we all hold dear. Allocating hard earned cash to acquiring products aimed at empowering us to better health is a decision not made lightly. Financial demands of everyday living aside, consumers are now more savvy when it comes to the products purchased and where they originate. Food especially has been under a spotlight in may households. Where does it come from? Is it organic and sustainable? Am I helping my local community stay in business by rethinking where I spend. All these are valid considerations, but are not limited only to everyday food. Supplementary health products have guided us to understand our bodies and their ability to let us know when things are not right. It is our internal alarm system that should be tuned when considering the right complementary health. It is a need understand and educate ourselves in what we use to aid in better health and wellbeing, that will lead to inferior products crossing our paths. Everyone loves a bargain, but the old Latin saying Caveat Emptor still holds true today. Let the Buyer beware has never been more important. Research is so very important when looking at health products. A dedicated focus on the supplier of the products can tell you a lot. A commitment to improved health is just the beginning. The source of the chaga mushroom begins with an in-depth knowledge coming from years of experience and devotion. The right time to harvest, the right area of the birch tree, and the environment in which the conks are grown all pay a part in identifying the best available. Alarmingly you may not even be buying chaga. Some conks may look like the chaga mushroom, but can be burls on the tree or even other growths that may be harmful to your health A commitment to continuous improvement in harvesting, processing and understanding of where chaga can lead will round out the obligations of a top level chaga supplier. Rules and regulations for organization who deal in alternative health products are a serious matter. They are in place to protect us. The more problematic traders will see such regulation as a mere roadblock in their way to grab the almighty dollar. While these traders may see FDA regulation as a speedbump on the way to infusing the market with inferior products at over-inflated prices, it is us, the consumer that can end their cycle. All we need it the tools and the knowledge to understand the difference between the good suppliers and the bad. Now you are armed with a few points to focus, your decision should become clearer. Price is one things, but it should never be the only consideration. Do you get what you pay for? Often, yes. Don’t be fooled by the cheapest product available. There’s generally a reason for it. When you know the differences you can avoid the inevitable concerns about whether this is the best product for you.